The particular skeletal remains known as Charlotte or the Charlotte whale, the White Whale, (Delphinapterus leucas,) named for the town where it was discovered, became the official state fossil of Vermont when Governor Howard Dean signed House Bill No. 236 at a ceremony at the Charlotte Central School in Charlotte, VermontonnJune 6, 1993.June 6, 1993. The skeleton of a 11,000 year old beluga whale, found in Charlotte, Vermont in 1849. This whale was preserved in the blue clays and muds of the Champlain Sea, an arm of the ocean that covered this area for over 2500 years. Whale recognized by its brilliant white to grey-white color, prominent forehead knob or "melon", and lack of a dorsal fin. The Charlotte whale was uncovered during construction of the first railroad between Rutland and Burlington in 1849. This specimen dates from approximately 12,500 years ago when the Atlantic Ocean flooded the Champlain Basin, which was depressed below sea level by huge glacial ice sheets, inundating it with marine waters. This whale was preserved in the blue clays and muds of the Champlain Sea, an arm of the ocean that covered this area for over 2500 years. 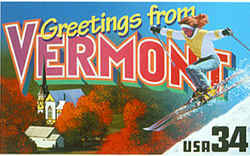 For 2500 years following that, this region existed as an arm of the Atlantic Ocean known as the Champlain Sea. This particular whale contains the most complete post-cranial remains of the Champlain specimens yet found.recognized by its brilliant white to grey-white color, prominent forehead knob or "melon", and lack of a dorsal fin. The Charlotte whale was uncovered during construction of the first railroad between Rutland and Burlington in 1849. This specimen dates from approximately 12,500 years ago when the Atlantic Ocean flooded the Champlain Basin, which was depressed below sea level by huge glacial ice sheets, inundating it with marine waters. This whale was preserved in the blue clays and muds of the Champlain Sea, an arm of the ocean that covered this area for over 2500 years. For 2500 years following that, this region existed as an arm of the Atlantic Ocean known as the Champlain Sea. This particular whale contains the most complete post-cranial remains of the Champlain specimens yet found. The Beluga occurs seasonally in ice-free Arctic seas, concentrating in circumpolar areas. They are one of the few toothed whales that follow a rigid migration pattern, waiting for the sea ice to break up in July before occupying their summer grounds. In winter they are forced to retreat to ice-free seas as the ice re-forms. Classification: Delphinapterus leucas means 'white dolphin without wings', referring to this species' lack of a dorsal fin. First classified as a dolphin - Delphinus leucas - in the late Eighteenth Century by German naturalist Peter Pallas, there was no move to acknowledge the differences between the Beluga and the oceanic dolphin family until it was later placed in a new genus. Local Names: Belukha (Russian); White Whale; White Beluga; Sea Canary. 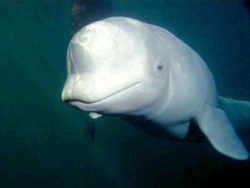 Description: The Beluga is a small whale with a stocky frame and rounded head. The bulbous melon and lips, the unfused neck and the soft and flexible blubber around the head mean that this whale is able to change its facial expressions easily. A dorsal ridge - more noticeable in males - replaces the dorsal fin, and in adult males the flippers curl upwards. In older individuals, the melon and lips become more pronounced and the skin, though muscular and supple, is quite rough. At birth, calves are grey in color, steadily lightening to a clue-tinged white at around five years and then pure white when adult. Before the summer month, the skin takes on a yellowish tinge. Males measure between 4-5.5m in length, with a body weight of between 1-1.5 tonnes; females are smaller (around 3-4.1m in length and weighing 0.4-1 tonne). The upper jaw holds nine pairs of teeth, the lower jaw, eight pairs. Recognition at sea: This species cannot normally be confused with other cetaceans, but at a distance an immature Beluga perhaps could be mistaken for a Narwhal. They are usually slow-swimming and remain in groups, spending a large proportion of time at or near the surface. Although the blow is low and indistinct, it can be heard for several hundred metres on a calm day. 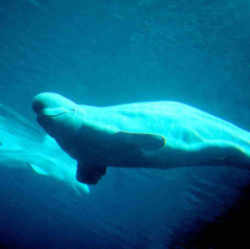 Habitat: Belugas seek out shallow coastal waters in summer, and in winter remain near the ice edge. Except for a small population in the Gulf of St Lawrence, Canada, this species is exclusively a subarctic or Arctic inhabitant. Food & Feeding: The Beluga feeds on fish, molluscs and other bottom-living invertebrates. Plankton is also taken. Due to the flexibility of the lips - a characteristic only shared by the Irrawaddy Dolphin - it has been theorized that this species may use a 'sucking' motion in order to draw prey into the mouth. Behavior: Belugas are very gregarious, tending to travel in groups of between two and fifteen individuals, with very tight mother/calf associations. These groups are either all cows/calves, or all bulls, the latter of which can extend into larger units of around five hundred individuals. Amassed groups of thousands have also been reported. Though usually quiet at the surface, they can become quite noisy and playful in their shallow summer grounds, with lob tailing and flipper-slapping being observed. When the skin begins to molt, the Belugas rub themselves along the gravel or sand at the seabed, or even stranding themselves temporarily. They communicate through whistles, 'belches' and squeaks, and have been found to have an advanced echolocation system, producing broad-band pulses un a narrow beam aimed from the melon. Estimated Current Population: 50,000-70,000 animals. Locally common. The Influence of Man: Belugas have been hunted without over-exploitation for over a thousand years by the Arctic people, but the arrival of commercial whaling expeditions soon meant that this was no longer to be. The hunting was intensive - between 1874 and 1911, Scotland slaughtered over 11,000 whales, with Russia taking 3,000-4,000 every year between 1900-60. Today, however, catches are lower in number: Russia took 420 whales in the 1970s, natives of Greenland take between 400-1,000 every year, with Canadian natives taking 600-1,000 and Alaskans 200-300 per annum. The Beluga population under the most threat is that of the Gulf of St Lawrence, Canada, which now numbers between 500-700 individuals. Oil exploration, hydroelectric plants, and shipping accidents are causing considerable disturbance, but they are not the main cause. The whales living in the Gulf are prone to chemical contamination - this industrial area uses the Gulf for the dumping of chemicals (such as DDT) and effluent. For some reason, these pollutants affect Belugas more than other species of cetacean, getting into their bloodstream and body tissue, and passing from mother to calf during gestation, often with the calf carrying more pollutant with either of its parents. Deformed calves have been recorded - some bent in an 'U' shape and unable to swim due to a poorly-developed spine. Due to the high concentrations of contamination, the members of the Gulf of St Lawrence population have to be treated as toxic waste when they die. The white whale (Delphinapterus leucas) was designated the state fossil by Act No. 66 (1993). It is a toothed whale recognized by its brilliant white to grey-white color, prominent forehead knob or "melon", and lack of a dorsal fin. The Charlotte whale was uncovered during construction of the first railroad between Rutland and Burlington in 1849. This specimen dates from approximately 12,500 years ago when the Atlantic Ocean flooded the Champlain Basin, which was depressed below sea level by huge glacial ice sheets, inundating it with marine waters. 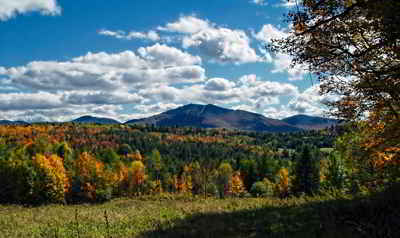 For 2500 years following that, this region existed as an arm of the Atlantic Ocean known as the Champlain Sea. This particular whale contains the most complete post-cranial remains of the Champlain specimens yet found. From Office of the Secretary of State, Vermont Legislative Directory and State Manual, Biennial Session, 1993-1994, p. 24. 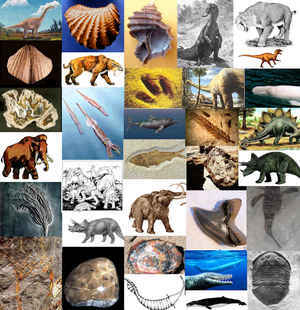 The law designating the white whale as the official Vermont state fossil is found in the Vermont Statutes, Title 1 Chapter 11, Section 509. Chapter 11: FLAG, INSIGNIA, SEAL, ETC.